Gionee has just announced their newest flagship which is the gionee s6 pro. 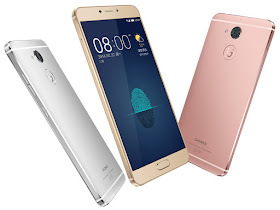 The S6 pro is more of like an upgrade to the gionee s6 which was released late last year. The gionee S6 plus features a more powerful processor, larger ram, better resolution and an a more latest OS compared to the S6. This device features a 5.5inches 2.5D curved IPS LCD capacitive touchscreen display with a resolution of 1080p. It is powered by Mediatek MT6755 Helio P10 chipset with a Quad-core cortex-A53 processor clocked at 1ghz and 1.8ghz variety which runs on the latest android version 6.0.1 marshmallow OS. It has a Mali-T860MP2 GPU, total ram of 4gb and an internal storage of 64gb which can be expanded through an SD card slot which van also serve as a sim 2 slot. The gionee S6 pro features a 13MP rear camera with f/2.0, phase-detection, autofocus and LED flash. It also has a front facing camera of 2mp. This device also has a finger print scanner which is located below the rear camera. You can check out some of the key features of the Gionee S6 Pro below. ==> Storage = 64GB Internal memory, expandable memory up to 128GB with micro SD.